It's no secret that there is always a danger when traveling that something horrible may happen to you. It's not a secret that something horrible may happen to you while at home either, but there's a common belief that the odds of death increase when you leave home. Gabe and I travel a lot, so we have long made peace with the fact that it may kill us someday. Furthermore, we often travel together, so we are both well aware of just how much we have made peace with that fact. Also, over the years, Gabe and I have developed a very strange way of communicating with each other - I like to refer to it as "Do as we do, not as we say." The first thing I was looking forward to upon arrival in China, besides seeing my best friend again, was a trip on the Maglev train. Gabe had informed me that we would have to take the Maglev between the airport and the city. I told him "well, that makes the trip right there!" and he had laughed. I'm pretty easy to entertain. The Maglev train - or Magnetic Elevated Train - can travel up to 400km/h. In bad weather, or in the winter, it will only go up to 300km/h - we assume to be safer. Even at 300km/h, it reduces an 45 minute car trip to 15 minutes by Maglev. So, a little jetlagged, but excited, I got on the Maglev train and grinned widely at Gabe when we reached our top speed for the trip. Gabe pointed out that sometimes the train runs on an angle around corners and explained about the regulation on speeds. Then he smiled at me and said, "The nice thing is that you know if it ever crashes into something, you will be killed instantly." I laughed, but agreed. It's always better not to suffer. "I doubt we'd even see it coming." Gabe added. The first week in China, we stayed in Yancheng - the small (by Chinese standards) city that Gabe teaches in. In Yancheng, even though it was winter, they still had the bicycle taxis. We weren't sure what they were called, so we just called them Rickshaws - but basically they are rickshaws pulled by bicycles, with less space between you and the driver. In Yancheng they cost about five bucks to take you anywhere in the inner city. On rainy days, they cover the passenger area with a tarp - so much so that the tarp is pulled down to your feet in front and you can't see anything outside - besides perhaps a narrow strip of pavement next to your foot. "The nice thing about this," I said to Gabe one rainy day, while we traveled back to his apartment from downtown, "Is that our death would be a surprise." Gabe considered for a moment, and then laughed, "True." Weeks later, we would get on a bicycle rickshaw on rain-slicked streets, and only notice once we were on our way that our driver didn't have any brakes. Gabe just laughed and said, "This should be interesting!" and indeed it was. Crossing the street is an interesting exercise in China. You just basically start walking. You have a moped/bicycle lane to cross that is the width of one car lane, and then you usually have about four lanes of car traffic to get through, then another moped/bicycle lane. The nice thing is that everyone in China is a stunt-car driver. It is amazing to watch traffic there - the reaction times, the bold moves that they don't think anything of. The fact is that you know the drivers attention is solely on the road, because it absolutely has to be. Oddly, in that respect, China is safer than North America when it comes to crossing the street or driving. That being said, you still have to be careful. It's a dance to cross the road - you must time it exactly, read which cars will slow and which ones will ignore you, how fast they are coming and whether there is a traffic light somewhere that is about to change. I crossed the road by turning into Gabe's shadow and concentrating on mimicking his movements exactly. In those moments, I was completely reliant on him. If Gabe messed up, I'd die right along with him. The chances of being killed crossing the road are pretty slim though. Drivers really do pay attention, and if you mess up, the most you do is piss someone off. That being said, city-buses stop for no man. Back again in Shanghai, there were a few instances where one of us would have to dart a hand out and yank the other one back by the arm just as a city-bus careened around the corner. Over the years, Gabe and I have unconsciously developed a no-touching policy...an exception, it seems, is when one of us needs to save the other person's life. Thank goodness our reflexes outvote our inhibitions. While in Xi'an, we were set up with a different guide every day. One day, we were paired with a lovely woman who drove us an hour or more outsides the city to see some sights on/near the mountains. 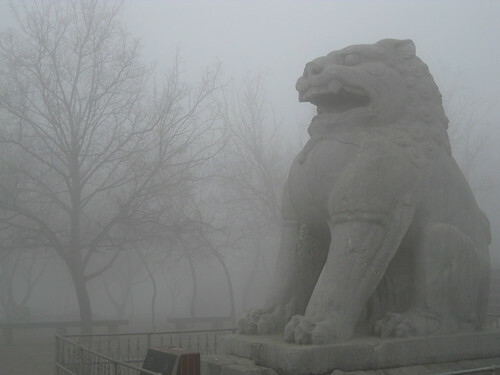 It was a foggy day, and the woman spoke no English, which meant that Gabe had to translate everything for me. This all meant that on the way back to the city, it was pretty easy for conversation to fade out and for all of us to drift inwards to our own thoughts. Gabe pulled out his cellphone and began texting people, as he was wont to do a few times a day. I stared out the window and thought about China and the world...and our lovely driver fell asleep. Thankfully, Chinese highways in the outskirts of Xi'an are pretty empty. Also, thankfully, we were in the fast lane (going about 120km/h) and the car drifted left not right. This meant that we smoothly sideswiped the centre guard-rail. I also learnt, that I had the best reaction time and reflexes out of the three of us (though, in all fairness, the driver was asleep at the time). I immediately pressed myself against the right side of the car and sucked in a breath. The driver then woke up and pulled the car back into the centre of the lane. A second later, Gabe reached a hand out blindly, looked around and said "Whoa!" It was all I could do not to laugh at him. A few days later, Gabe was joking with a friend and said that I should start counting the amount of times that I've almost died during my trip so far. I said, "I think I've already lost count." The day I was to leave China, Gabe and I woke early and went out to hail a cab to take us to the bus station. In the early morning, there weren't many other cars on the road. The cab sped along the wide straight boulevard to the bus station, Gabe in the front seat (he likes to sit in the front of cabs) and me behind him in the back. Suddenly, a car pulled out right in front of us. The cab driver slammed on the breaks, I tried to brace myself against the passenger seat as I slid forward. Our cab driver had to swerve into the oncoming traffic lanes, but thankfully there was no oncoming traffic. I believe there may have been some Chinese curses thrown about, but within seconds we were once again on our way, speeding towards the bus station. Gabe turned around in the passenger seat and said, "That's three." After four hours on the bus, we were driving down the narrow laneway that leads to the Shanghai bus terminal, when suddenly another bus pulled out in front of us. Our bus slammed on the breaks, as Gabe and I attempted to brace ourselves as we slid forward in our seats. The bus stopped JUST in time, and Gabe turned to me and said, "That's four." I said, "If this morning was three, and that was four, and I'm guessing 'Suicidey' was another one...what's the one that I'm missing?" Gabe gave a shrug, and replied, "I don't know...a bus or something?" "Oh yeah," I said, and wondered how it was possible to forget a near-death experience, but then again, I HAD been traveling with Gabe. Gabe saw me off at the airport, informing me confidently that he had rigged it so that I was the only one on the flight, the plane was on autopilot, it was programmed to crash into the ocean, and that just before it went down, a video of Gabe laughing at me would play on the video screens. I rolled my eyes, and told him that I would email him when I got to Singapore, so that he would know I had once again foiled all his plans to kill me. We smiled and waved a goodbye. It occurred to me while on the plane to Singapore, that it was a good thing I didn't believe in omens. I had nearly been killed twice on the way to the airport, and Gabe's final tally for our near-death experiences was four - which, in Chinese, is synonymous with death. Four also happens to be Gabe's favorite number.